Rumors have been starting to float around regarding MobileMe features coming to iOS device users and now some hard evidence backing up these claims has come to light. 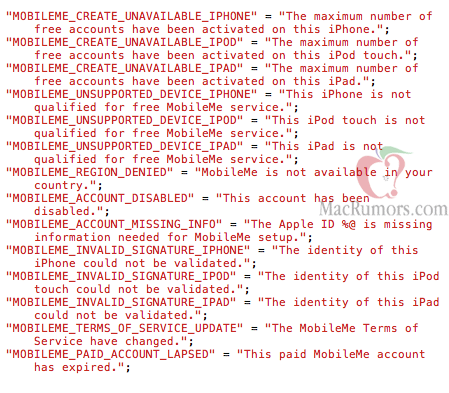 Our friends over at MacRumors have found what appears to proof of free MobileMe accounts for iOS devices via snippets of code from the iOS SDK and iOS 4.2.1 AppleAccounts.framework (shown above). As you can see, within the code it says ““This Apple ID cannot be used for MobileMe Mail, but you can use it for other MobileMe services”. This is leading many to believe that there will be a free version of MobileMe that would appear to not include MobileMe mail. Many are speculating that this free version of MobileMe will be implemented to provide iOS users with over the air syncing capabilities, which has always been one of the biggest user requests. Other rumors point towards the free accounts also including Find my iPhone, and online photo galleries, in addition to over the air syncing for Safari, Contacts, Calendars, etc. One Response to MobileMe features coming to iOS devices free of charge?